I feel very privileged to have been able to try skiing; this being my second time I was better prepared for the expense of the whole thing. It’s pretty pricey, but, if you like an active kind of break from work, is an awesome way to unwind. Plus what can beat a winter holiday with views like the one above?! Skiing this year was a package, catered all in affair which helped with the budget factor. As our group was very much mixed ability we picked Villeneuve, Serre Chevalier in the French Alps. The general consensus of our group was that the area is better for skiing than snowboarding; our boarders ended up swopping for skis. 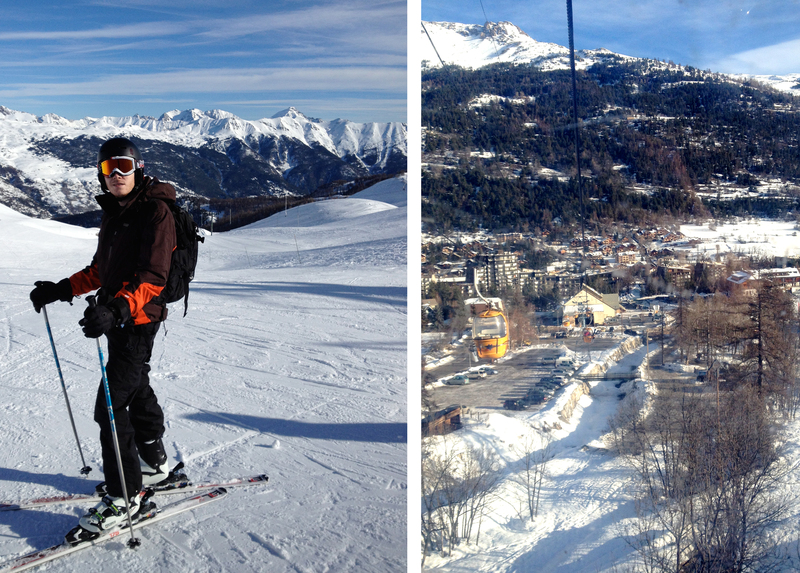 There is a good range of quite easy to the more tricky, faster runs and all slopes lead down to the main town. If you’re looking for a busy nightlife then maybe Villeneuve’s not the place for you, but we had some great nights out playing darts and cards in the pub as well as eating fondue and drinking lots of red wine. We enjoyed: Le Frog right at the bottom of one of the main ski runs for a petit boisson before heading home, La Pastorale on Rue de la Guisane for fondue and Le Jardin on the Route de Pré-Long for an amazing lunch. The Telegraph has just done a little review of the area too if you want more info.